As a publicly traded corporation, Pacific Gas & Electric reported $17.1 billion a year in revenues from its electric and gas operations. After operating costs, expenses and taxes, it still made out with a profit of $1.7 billion last year. So why has California’s largest utility filed for bankruptcy? PG&E is being sued by thousands of wildfire victims for property damage, medical expenses and a heap of punitive and personal injury damages alleging corporate negligence. Insurance carriers that have paid claims to homeowners and businesses for property damage have filed dozens of subrogation complaints. Even local governments, such as Mendocino, Napa and Sonoma counties and the city of Santa Rosa, have piled on with their own legal claims. So even though the company was just absolved by state fire investigators in last year’s deadly Tubbs Fire, it still faces potentially tens of billions of dollars in liabilities. For one thing, its equipment remains a prime suspect in the Camp Fire that killed 86 people in Butte County late last year. A PG&E employee spotted flames near a shorted-out utility tower, at the same place Cal Fire identified as the start of the state’s most destructive wildfire. 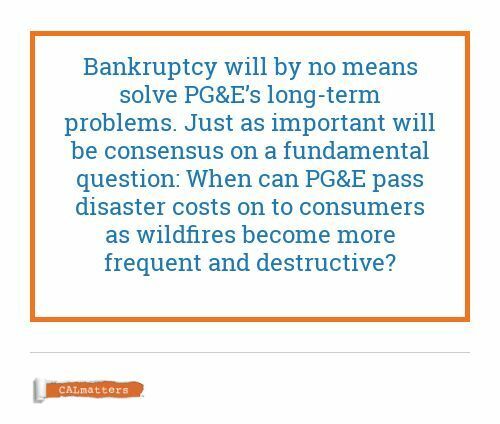 But bankruptcy will by no means solve PG&E’s long-term problems, which will require legislative and regulatory solutions. Because what will be just as important in the months and years ahead is consensus on a fundamental question: When can the utility pass disaster costs on to consumers as wildfires become more frequent and destructive? And unfortunately for PG&E, that’s about public trust. Even before the utility announced its intent to reorganize in bankruptcy court, the financial market expressed concerns about PG&E’s ability to recover costs associated with these recent disasters. It was part of the reason credit agencies recently downgraded PG&E to junk status, which only made it more expensive and difficult to access capital. “The rating downgrade reflects the material exposure to new potential liabilities associated with the Camp Fire and the uncertainties associated with how the fire-related liabilities will be recovered,” said Jeff Cassella, vice president at Moody’s Investors Service. 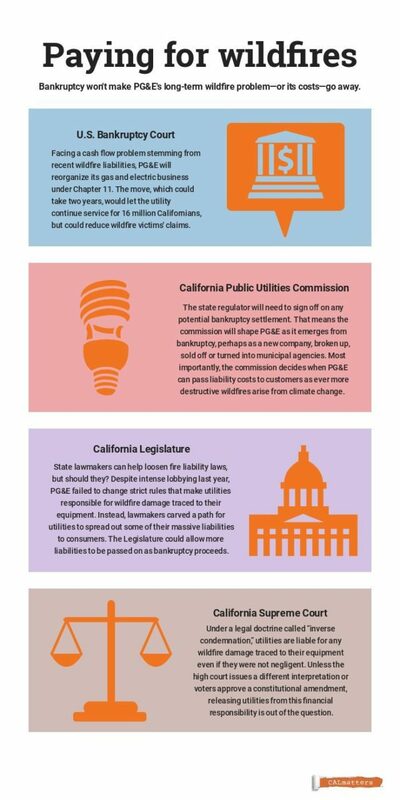 As climate change impacts corporations’ bottom line, the same concerns have extended to other California utilities, triggering downgrades for both Southern California Edison and San Diego Gas & Electric. Cassella noted that state lawmakers passed a $1 billion legislation that did nothing to address the 2018 wildfires. SB 901’s most controversial provision, to make it easier for utility companies to absorb the cost of fire damages by borrowing money and charging customers to pay it back over many years, covered the 2017 fires and those that start in 2019, but not any when the Camp Fire hit. PG&E also tried — but failed — to get the Legislature to loosen fire liability laws. Under a legal doctrine called “inverse condemnation,” utilities are liable for any wildfire damage traced to their equipment even if they were not negligent in maintaining it. Unless the state Supreme Court decided to issue a different interpretation or voters approved a constitutional amendment, releasing utilities of this financial responsibility would be pretty much out of the question. Enter the California Public Utilities Commission. The five-member commission regulates investor-owned utilities in the state and could decide whether PG&E acted prudently and should be allowed to pass on wildfire costs — even the damages a utility pays out in lawsuits — to consumers. But a precedent has been set that has made PG&E think twice about its ability to recover wildfire costs through rate increases. In 2017, the commission blocked San Diego Gas & Electric from passing on $379 million in liability costs stemming from a 2007 wildfire. In a unanimous vote, the commission found the utility’s management of its facilities unreasonable. It’s unclear what the CPUC would do if PG&E asked to pass on costs from the latest wildfires. Even without liabilities, the cost to maintain public safety is creeping up. PG&E is asking for a $1.1 billion rate increase for wildfire prevention, risk reduction and safety enhancements, which, if approved by state regulators, would increase the average residential customer bill by 6.4 percent or $10.57 per month. Wildfire victims and their lawyers are quick to question PG&E’s motives, calling Chapter 11 a tactic to discourage and discount lawsuits rather than taking responsibility for the spate of recent tragedies. 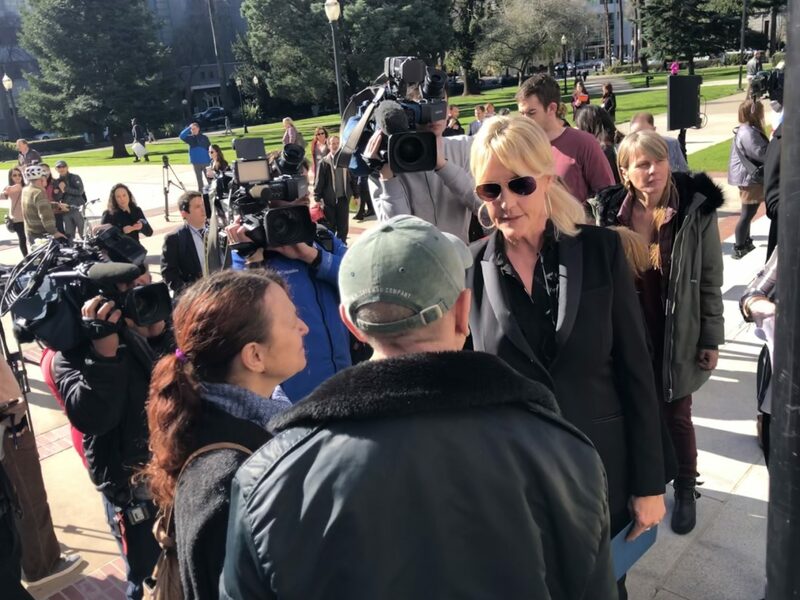 Camp Fire victims recently rallied at the state capitol with legal activist Erin Brockovich, who was portrayed by Julia Roberts in the 2000 box office hit movie. Evans noted that under bankruptcy, wildfire victims with claims in trial court would be treated as unsecured creditors. “Their claims would be delayed and probably discounted,” she said then — a fear that could now come true. Story originally published by CALmatters.org, a nonprofit, nonpartisan media venture explaining California policies and politics.